Ventry or Ceann Trá in Irish, is a sandy beach located in a Natural heritage area rich in flora and fauna. The beach is situated to the south west of the village of Ventry, on the Dingle Peninsula surrounding the sheltered bay of Ventry Harbour. The beach comprises of Ventry Strand and other small dunes. a small lake, wet grasslands and an extensive Common Reed swamp. Access is just beyond the village of Ventry. This beach is lifeguarded during the bathing season lifeguard times are posted on the information noticeboard at the beach. 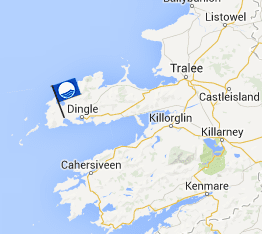 Located southwest of Ventry on the Dingle Peninsula, is this very popular Blue Flag Beach. Access to the beach, can be gained just outside Ventry Village. When you arrive you can relax on the sandy strand, explore the small dunes or bring the dog for a walk in the extensive wet grasslands. Lots of rare plants and animals can be found around here, perfect for the wildlife enthusiast and general public alike.